Buy 1 for $24.39Buy 2 / Save $1.30!Buy 3 / Save $4.88! 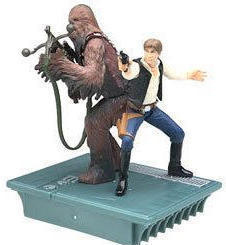 Size (inches): 4.13" X 6.10" X 7.28"
Hasbro's Star Wars 25th Annniversary sets are a dream for collectrs as they feature some of the most memorable scenes in film history recreated as action figures. These very nicely detailed figures additionally come in packaging that allows it to be displayed and seen without having to be removed from the box. Not so much meant to be played with these we put out for collectors and meet that are perfectly.saber duel! This 2 pack, my personal favorite, features our favorite duo gunning down stormtroopers as they try to make it back to the millenium falcon to escape the dreaded death star.